Japan's male judokas brought home no gold medals from London in 2012 and the overall result was the worst for Japan since Seoul in 1988. Ni-kan Sports [日刊スポーツ] declared the results of the 2016 Rio de Janeiro games a "judo resurrection" for Japan [柔道腹活] and rejoiced that "for the first time in history!! all male team members won medals" [史上初！！男子全階級メダル]. Japan's men brought home two golds, one silver, and four bronze medals. The ladies pulled their weight too, earning one gold and four bronze medals, which although better than London, was their worst medal haul since Seoul. But not everyone was happy. In fact, those in the know expressed disappointment, not so much at the results, as the general direction of judo. Two of the best qualified to comment were 1992 Barcelona 71. kg. gold medalist Toshihiko Koga [古賀稔彦] and Kôsei Inoue [井上康生], 2000 Sydney 100 kg. gold medalist and currently coach of the Japanese team. "It was the final match to decide the champion of the heavy-weight class. Honestly, it was regrettable. Because we couldn't see a 'judo' match. Riner went all out to avoid fighting. It is a severe view but fans were expecting to see attack and defense. But they were disappointed. However, the referee in this tournament, missed many chances to stop [someone] from avoiding fighting. The International Judo Federation [国際柔道連盟] recommended an 'active style of judo' [しっかり組んで技を掛け合う柔道] and amended the rules of shido  to encourage that. It worked for a while. But competitors, especially foreigners have focused on a style of avoiding grips more than before. And the officials have stood by and let them get away with it. Now I am very worried about where judo is headed. Riner's previous powerful strength [力強さ] was absolutely not in evidence. If Riner had come to grips, Harasawa would have had a good chance. The 'upside' [収穫] was that he pushed Riner to the limit on the Big Stage [Olympic Final match]. The Japanese Men's heavy weight continued to have trouble and Riner didn't perform up to his past standard but it was enough to win the title. All members of the Japanese Men's Team (seven judokas, all weight classes) entered the winner's circle. Five of the seven female judokas also won medals. 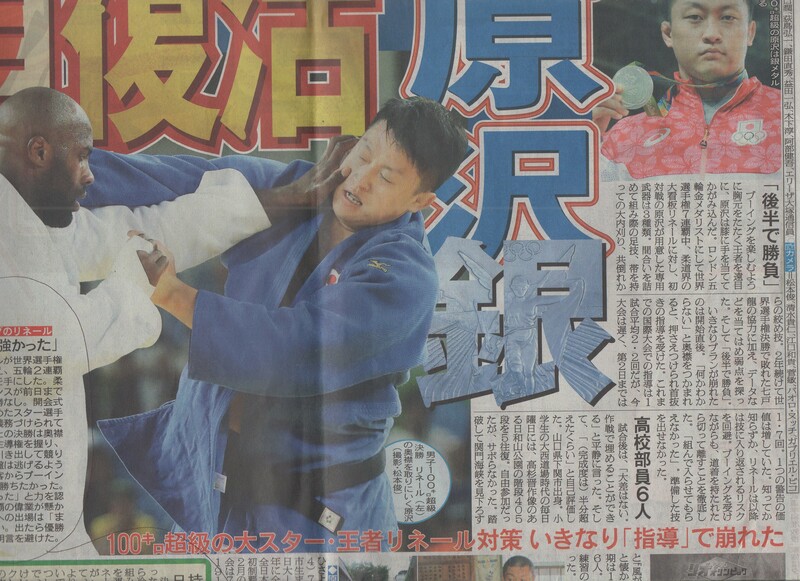 We can't avoid noticing that there were problems nevertheless a lot of (Japanese) judokas won medals. It is necessary to think about what to do to change the bronze medals into gold medals next time." "The final match was a lamentable contest. Harasawa, from the first match, coolly came to grips with his opponent and calmly took care of business. But Riner was not as strong as he had been before, and instead of going for a technique, he fell to the level of winning by not engaging and looking for a victory by shido. Riner's level had dropped so much that I was excited because I thought Harasawa had a small chance [隙]. But the match was uninteresting because Riner pulled his gi away when Harasawa tried to grab it. That is the first thing he was thinking about. Then when he got the lead in shido , he only tried to avoid gripping. Using the amended rule, his intention was to avoid throwing. In the most watched match of the games (the over 100 kg. final), what we could see was a match without any techniques. Interest in judo will dissipate if this trend continues. It was criticized that judo is regressing to the past time when judo was boring to watch. We need to return to the original judo ideal [原点] of "hold and throw" [持って投げる]. For that to happen we have to break away from the trend of trying to win by shidos." Kôsei Inoue assessed the team's performance in Ni-kan Sports. Inoue praised the team collectively ["たくましかったでｓね"] and individually, focusing on the positive, with a forward-looking view to 2020. The males ranged in age from 21 (ベイカー茉秋, Mashu Baker, 90 kg.) to 26 (海老沼匡, Masashi Ebinuma, 66 kg.). Most are young enough to have a good shot at representing Japan in Tokyo 2020. Inoue's only reference to Teddy Riner was "原沢久喜。。。絶対王者のりネールを逃げさせる" [”Reigning champion Riner totally ran away from Hisayoshi Harasawa"]. "Riner was Jeered; Harasawa was strong. Riner won seven world judo titles and now has two Olympic titles too. Until yesterday the French men's and women's judo teams had no gold medals. The team's star had to win to salvage something for French judo. Both men sought sleeve and collar grips but Riner took the initiative and a made Harasawa look non-combative. Riner received one shido, Harasawa received two shidos. At the end, with a one shido advantage, Riner kept a defensive posture, and in return he was jeered by the spectators. 'I wanted to win by Ippon. Harasawa was strong' Riner said, admitting Harawasa's power. Does he intend to go for a third gold medal in the 2020 Tokyo Olympics? 'I don't know yet. If I do, I want to win.' he cracked." 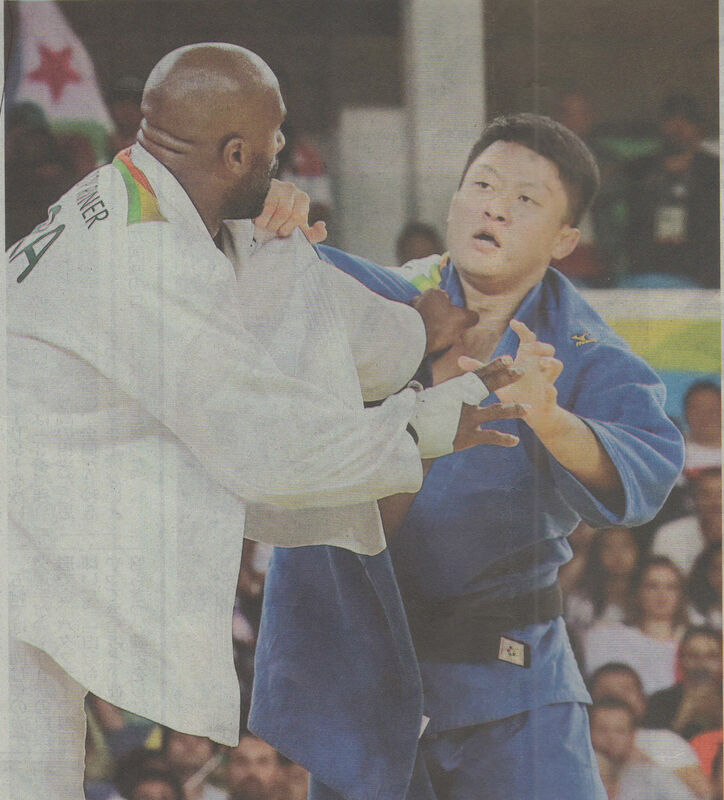 The Asahi Shimbun [朝日新聞] also commented disapprovingly on Riner's decision to go for winning rather than beautiful, authentic, skillful judo, saying 'Riner seemed tired and couldn't attack' ['疲労見えた王者攻め切れなかった']. "I felt that my opponent was out of breathe, but I couldn't apply any technique. My opponent dominated the gripping. I lost by a difference of one shido. If I could have gotten my grips, things might have been different." Japanese competitors want to win as much as foreigners do (possibly more, according to at least one study). While it is true that they (and Japanese fans) prefer dramatic throws, it is also true that they believe (probably correctly, especially in the case of Riner vs. Harasawa) that some of their rivals excessively try to exploit the minor points and penalties rules to avoid higher risk confrontations, where the Japanese seem to have a comparative advantage (or at least, again with reference to Riner vs. Harasawa) where they believe that their chances of winning are better by trying to lure the Japanese into accumulating more minor penalties than by taking grips and going for what the Japanese consider 'authentic, skillful judo'. Koga clearly resented Riner for doing that. Inoue seemed more accepting. After all, he is an active coach and winning is the priority. The final medal count is what everyone remembers. Looking good is a bonus, if circumstances allow. Inoue understands Riner's motivations (obviously, Koga does too, but Inoue is the team coach). An Olympic gold medal match is not just another match. A lot rides on it--money, careers, endorsements. As a Japanese proverb puts it '人の噂も７５日' ['people remember rumors for 75 days']. Two and a half months from now, Teddy Riner will be a two-time Olympic gold medalist and no one will remember (or care) that he accomplished it by running away from a young Japanese boy with no international titles to speak of. It isn't really Riner's fault. His job is to win according to the rules. The fault is the IJF's. They make the rules. Unfortunately, as history has shown, competitors will usually (or almost always) try to use the rules to win the match, rather than to demonstrate 'authentic, skillful judo'. That's not what Kano wanted. In fact, it isn't what the IJF wants either. What the IJF wants is fan-friendly judo, something as close to professional wrestling as it can get and still call itself judo. The IJF wants what the television companies and sponsors want, and what they want is what the mass of television viewers want, which is lively, comprehensible action. Harasawa has his silver medal and the satisfaction of knowing that he at least tried to play 'authentic, skillful judo' (he also did it while staying calm and cool, which Koga, Inoue, the Japanese fans and press liked). He fell a tad short, but then, he was facing a man with seven world titles and an Olympic gold medal (now two of them). Harasawa will undoubtedly have another chance in 2020 and he'll be looking for Teddy Riner. 1. A shido (指導) is the smallest of the negative points (i.e., penalties). If the score is otherwise equal, the man with the fewest shidos will be declared the victor. 2. Because Harasawa was penalized two shidos to Riner's one shido. 3. Two comments by Trevor Leggett, the first from "Judo and Display Professionalism", written in 1957 when international judo was just getting underway at the time). and reprinted in Bulletin of the Kano Society, 1:1, September 2000, p. 3. "....sports based on display professionalism have to cater for a public who know and care nothing for the sport except as an entertainment. Doubtless some performers and promoters try to educate them but in the end they are absolutely at the mercy of the public’s tastes and whims. In Judo, on the contrary, the sport is entirely supported by its own enthusiasts and quite independent of what the general uninformed public thinks or wants." "Budo has no future as such, because its typical representatives have now become mere games. Like many games, they have dropped away from the ideal of training into the aim of winning, often as professionals entertaining a crowd." That's where judo is today, in 2016. As we almost learned four years ago, judo's place in the Olympics is not assured. The Olympics belongs to the IOC, and the IOC is very interested in viewer ratings because that is what television companies care about, which they do because that is what sponsors care about. Viewers don't want to watch boring contest that they can't understand. Sponsors won't pay television companies to broadcast events that viewers (most of whom aren't judokas and don't care about judo) don't watch. Television companies won't pay the IOC money for broadcast rights. National Organizing Committees and sports federations (like the IJF) get a share. Everyone wants the money. 'Authentic , skillful judo' seems to be the least thing on anyone's minds. Barney, R. K., Wenn, S. R., & Martyn, S. G. (2002). The International Olympic Committee and the Rise of Olympic Commercialism. Salt Lake City, UT: University of Utah Press. Sato, Shohei. (2013). The sportification of judo: global convergence and evolution. Journal of Global History, 8(02), 299-317. Wenn, S. R. (1993). Lights! Camera! Little Action: Television, Avery Brundage and the 1956 Melbourne Olympics. Sporting Traditions, 10(1), 38-53. Wenn, S. R. (1998). A turning point for IOC television policy: US television rights negotiations and the 1980 Lake Placid and Moscow Olympic festivals. Journal of Sport History, 25(1), 87-118. Villamón, M., Brown, D., Espartero, J., & Gutiérrez, C. (2004). Reflexive Modernization and the Disembedding of Jūdō from 1946 to the 2000 Sydney Olympics. International Review for the Sociology of Sport, 39(2), 139-156.